Last night the Princess and I went to see Alice, Through the Looking Glass, the latest Tim Burton movie. Of course we loved it. Burton is one of the most interesting story-tellers of our time. Did you know he is two years younger than me? 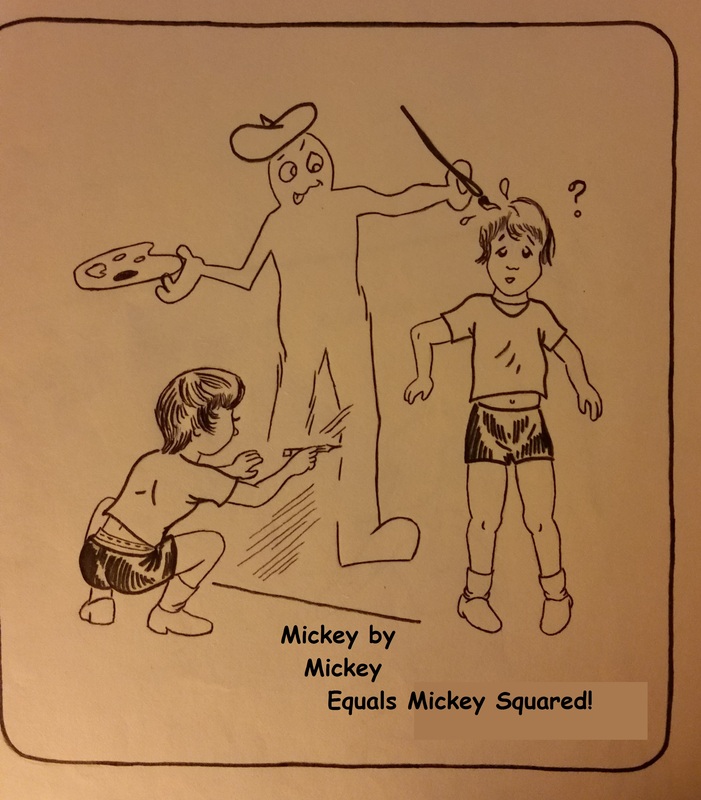 And also, like me, he began as a cartoonist and is totally dedicated to the idea that every artist is a surrealist and must exaggerate, elucidate, equivocate, and numerous other things that start with the letter “e” and end with the suffix “ate” simply because that’s how surrealism starts. You notice a little bit of weirdness in real life and blow it all out of proportion with lies and coloring of meaning and relentless “what-iffing?” If you don’t see surrealism in those last two sentences of purple paisley prose… then maybe you can see it visually in Burton’s many masterpieces. Tim Burton began his legacy as an apprentice Disney animator specializing in stop-motion animation. But he was just another creative nobody like me until the launch of his small-budget monster hit, Pee-Wee’s Big Adventure. Of course, any time you can pull in huge profits for little investments, you will have Hollywood executives ramming the heads of their unpaid interns like battering rams against your door so they can get in and throw money at you. Batman was the first time I actually took notice of Tim. And not just as a director of a film… eventually two films. He was gifted at assembling a cast. And this would work to his advantage as several singular talents attached themselves to him and worked in his movie projects repeatedly. And his repeated collaboration with Danny Elfman and his music was easily as great a master-stroke of genius as John Williams with Spielberg and Lucas. He has repeatedly used his movies to describe and rewrite his own life story as a misunderstood genius flubbing horribly in the quest to fit in with a world full of “regular people”. His sense of humor, of course, is distinctly and colorfully bizarre. DSTF-0046r JOHNNY DEPP as Barnabas Collins in Warner Bros. Pictures and Village Roadshow Pictures DARK SHADOWS, a Warner Bros. Pictures release. Burton is, just like me, a child of the 70’s. He references things like the old gothic soap opera, Dark Shadows, that were a part of his impressionable youth just as they were mine. He picks stories about things he truly cares about, and that is also just like me. So, in a rather bizarre coincidence that is entirely appropriate to surrealists, I love any Tim Burton movie simply because it is a Tim Burton movie. He is probably me in an alternate dimension. And as such, I already know I will love his next movie, whatever the heck it is. Yes, I admit it. I am a Surrealist. I also hope that it is not too terrible a thing to be. Because I truly think that everyone who was raised by television, and lived through the revolution where computers took over human life, is one too. There is a certain satisfaction to be had in knowing for certain how to define oneself. I learned about Surrealism in high school art class back in the early 70’s. I saw and admired the works of Salvador Dali, Rene Magritte, and Max Ernst. 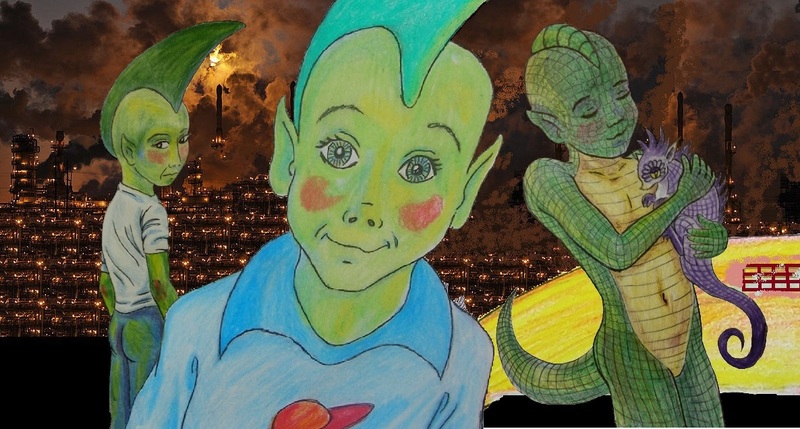 And I realized that everything I wanted to do in the Realm of Art, whether it was weird paintings, cartoons, comic book art, or bizarre puppet shows… fantasy, science fiction, or humor… it was ALL Surrealism. Surrealism saturates out culture and our very thinking. We are drawn to watch baseball by the antics of a giant pantomime chicken. Our food choices are influenced by a happy red, yellow, and white clown who battles a blobby purple monster and a hamburglar over shakes and French fries. 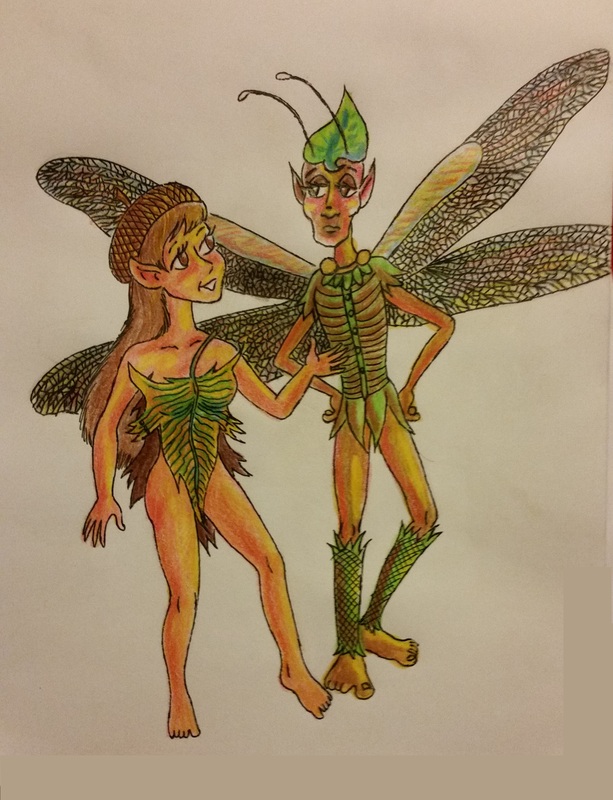 It is only natural then, that I would want to draw bug-sized fairies who would saddle and ride a red rooster. I have embraced surrealism as a way of life. I have no trouble writing a poem about the difficulties of life by writing about a game of bowling where you have to roll a moose down the alley into the pins. Surrealism is all about creating things by lumping all kinds of disparate goodies into the same pot and cooking it up as a stew. It is important that the stew tastes good in the end, so the mixture has to have large doses of reality and realism in it. Dali painted melting watches and boneless soft-sculpture people with almost photographic realism. I am compelled to do that too. And what is humor, after all, if not lumping strange things together into a reality sandwich that makes you laugh because it takes you by surprise? I don’t shy away from weirdness. I embrace it. It makes life all the funnier. And why did I put bullet points on everything in this post? Because it allows me to mash bits of wit and wisdom together in a weird way that only seems to have no connection, one to the other, and only seems to make no sense. Sometimes we just have to look at things sideways. I was recently accused of being eclectic in my posting topics by one regular commentator. I could wear that word like a badge of honor. This describes a combination of many different individual elements of styles, themes, mediums or inspirations pooled from many sources. It can refer to musical tastes, dress sense, interior design…many things. So, if I am going to make sense of this whole mess of words and ideas and bizarre images, let me do it with a picture that I think is surreal. 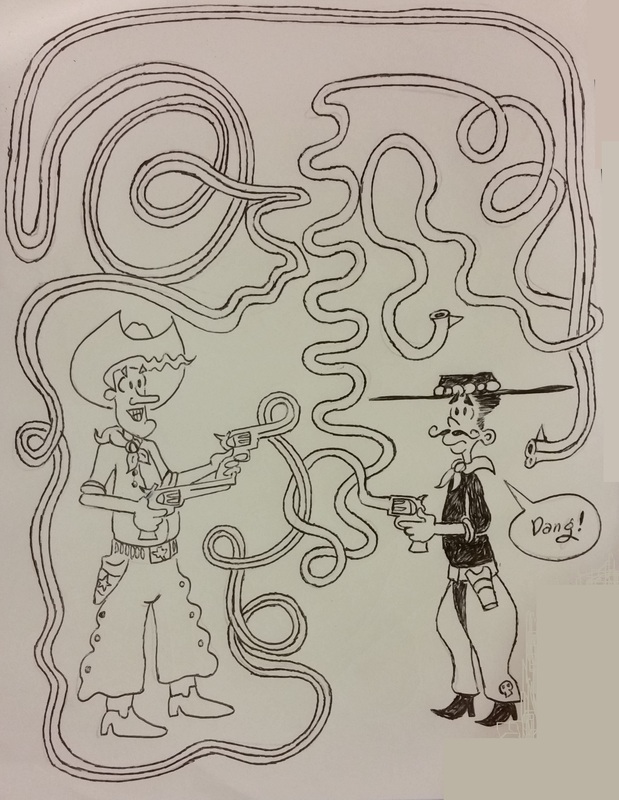 The moral of the story; never challenge Cowboy Flash Crumpwell to a rubber gun duel. He was the marshal in charge at Crumpwell’s Wild West Dude Ranch and Rabbit Farm. It was his duty to create order and peace on a lawless frontier… and keep the fur-bearing bunnies happy, and making more rabbit fur. So, when Pistoleer Pete Pistachio-Mustachio came to town, it was totally up to Marshal Flash Crumpwell to put an end to his terrible reign of Pistachio-ness. They faced off on either end of Main Street. Their spurs clanked and jangled as they started their bowlegged walks towards destiny and each other. Then the guns came out. The barrels began to wiggle and elongate like elastic melting on a hot stove. Up and down and all around dueling rubber guns dipped and danced and maneuvered through two dimensional space, until finally… Flash’s gun found a target in Pete’s ear. a 20th-century avant-garde movement in art and literature that sought to release the creative potential of the unconscious mind, for example by the irrational juxtaposition of images. So here is my conclusion; If you have ever wondered, “Why am I drawn to reading the meandering nonsense of this daft bugger? And why does he do all this irrational and random stuff?”… It is because I am desperately infected with the affliction of surrealism. Take pity on me. Laugh at my kooky quirks. I have told you before that I am a seriously committed surrealist. Not in the sense of “committed to an institution” sort of committed, but seriously committed. All cartoonists are by nature surrealists. Bill Watterson created Calvin and Hobbes around the idea that a toy tiger can come to life in the evil imagination of a child. Jim Davis created Garfield around a seriously self-absorbed and greedy talking cat. Elsie Segar created Popeye about a one-eyed sailor who drank from a magic pool to gain invincibility and maintains it with iron-fortified cans of spinach. To be a surrealist, you must put unlikely things together to make something fantastically super-real… so unreal it seems flawlessly real… er, how do you actually define surrealism without resorting to the dictionary definition about “juxtaposing severely mismatched items created with photo-realism”? Surrealism is actually more real than realism. If you simply take a photograph of your picture idea, a picture of a birthday cake or a picture of a clown or a picture of your favorite bicycle’s back wheel, you are not showing the reality of life. You are only taking a photograph of a thing. You cannot get more than the physical, objective reality of that thing captured on photographic paper… or in a digital image (I am learning not to be a dinosaur even though I am old). Reality is so much more than that. It is the feeling, the evocation, the nuance, the… stuffy stuff-ness of stuff… and an infinity of other things that make reality seem real. Okay, this is another filler piece to allow me to post every day of 2015. But it does give me a chance to write down a few things I have been thinking about… And I do realize allowing me to think nowadays is a completely risky proposition. But when you talk about Nuts and Bolts, you are talking about how things are put together. The nut keeps the attachment from sliding apart and failing to do its job, but the real work of bonding things together is done by the bolt. So, to keep mangling the metaphor until it is either as tightly bolted as it will go, or it bursts from the torque and stress, let me talk about some bolts in my cartooning endeavors. 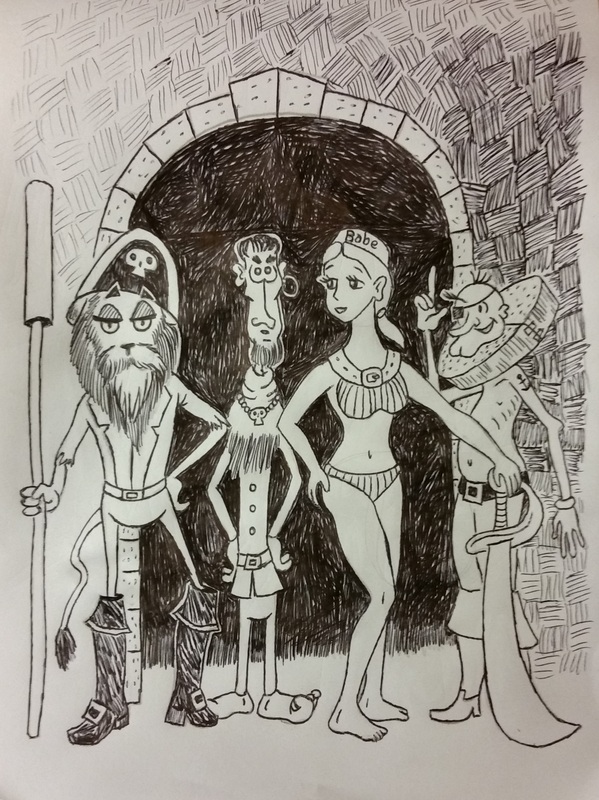 This most recent pen and ink Paffooney is a cartoon panel about Pirates from the imaginary dream world of Fantastica. In the cartoon environment I am working on now, Pirates take your gold and valuables basically by being bankers and compounding your interest… mostly by compounding really, really hard… like with hammers and heavy swords. So here is one of the bolts holding my posts together. I am financially troubled right now (right now meaning the last twenty years) by trouble with credit card debt and banks. I fight that kind of trouble with swords of satire. You find me complaining a lot about this particular topic by mostly metaphorical means. And that leads to another bolt that is a common rivet in the girders of my purple paisley prose. 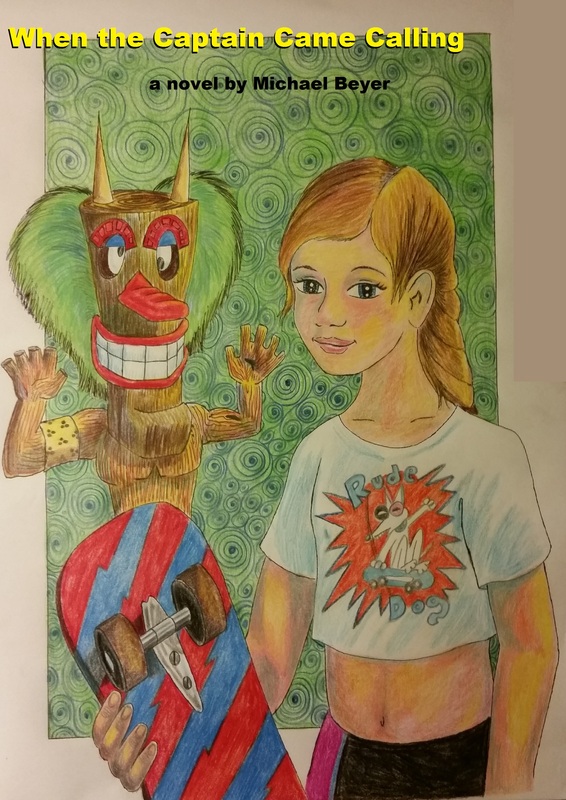 I use metaphors and drawings in a way that can be characterized by the artistic term (or is that autistic term?) surrealism. 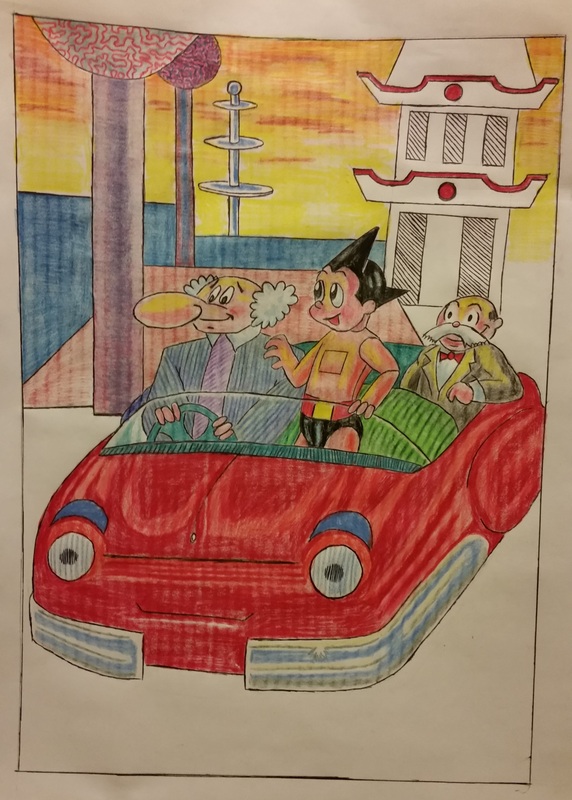 Yes, I am an out-of-the-closet surrealist like Salvador Dali, Juan Miro, and Rene Magritte. I would like to argue that I am also a surrealist in the manner of Bill Watterson, creator of Calvin and Hobbes, Charles Schultz, creator of Peanuts, and Dan Piraro, creator of Bizzaro, but cartoonists in general don’t tend to be out of the closet, willing to admit that they juxtapose disjointed images with realist elements in them to make a comic point or raise an emotional response. That is something most cartoonists are unwilling to let their parents understand about them… that, or they simply don’t know what big words like juxtapose mean… because cartoonist are generally unwilling to look things up in the dictionary. I hope this paragraph doesn’t make your brain hurt. But if it does… well, that’s why most of us surrealists try really hard to keep it secret and end up living a double life. I think you can also tell by today’s post that I need to revisit this idea of examining bolts. I am swiftly coming to the end of today’s 500 words, and I have only covered two working bolts. What kind of structure can stand up to high winds with only two bolts in the entire thing? But hopefully it won’t all suddenly collapse before I have a chance to come back and place a few more bolts. And on that note, I am at 514.